The spinach-and-tomato egusi stew was delicious, but much of the meat was too tough. A satisfying meal at Miliki, a Nigerian restaurant that opened three years ago in Oakland's Laurel District, might consist of an order of crispy akara fritters and a pungent bitter leaf stew, everything washed down with a couple bottles of ice-cold Malta Guinness. If that sounds intriguing but hopelessly unfamiliar, don't feel bad. Although the East Bay is awash with fantastic Ethiopian and Eritrean food, West African restaurants are harder to come by — and that deficit has become even more pronounced ever since Soleil Banguid, the chef at Soleil's African Cuisine, in Alameda, passed away earlier this year. So, in a local food culture where the same restaurant genres and subgenres seem to sprout up all the time — what, yet another Cal-Italian restaurant or upscale burger joint? — Miliki offers a rare boon to the adventure seeker: Chances are, you'll try something new. It's easy even for Laurel residents to overlook Miliki, as the restaurant wins style points neither for its decor nor for its sleepy atmosphere, at least in the early evening, when the only other customers were a handful of African businessmen picking up takeout orders. So the food is the main attraction. And the food, according to co-owner Bunmi Aregbe, is cooked in the traditional Nigerian way, with many of the herbs and spices imported from Africa. Translation: Many of the dishes were heavily spiced, with bold, funky flavors and ingredients that weren't immediately recognizable — dishes that catered to the tastes of the aforementioned African businessmen rather than the typical Westerner. They were what we in the trade call "challenging." But, with few exceptions, they were also quite tasty. 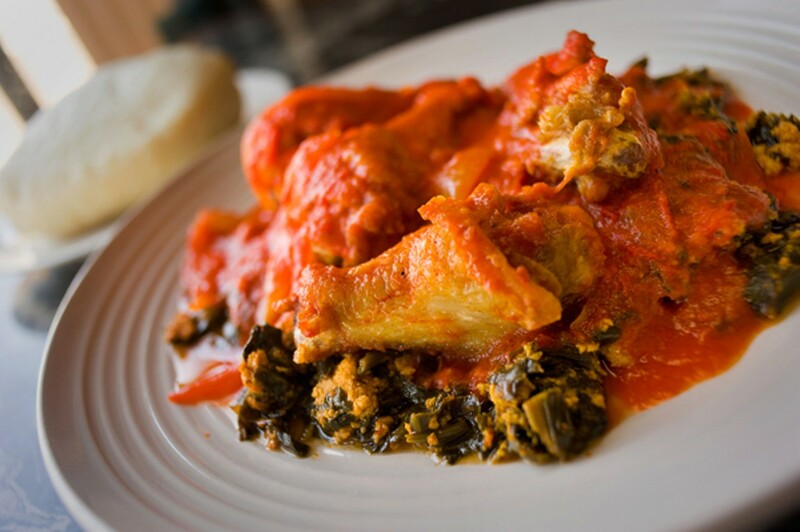 The quintessential Nigerian dish is egusi, an earthy slow-cooked spinach-and-tomato stew that is thickened with the ground-up seeds of a kind of African melon (the "egusi"). Ours also came with various beef parts (including the tendon and the tripe) and chicken drumettes. At Maliki, this is served, as is traditional, with iyan (or, as it's listed at many African restaurants, fufu) — a ball of sticky white dough made from pounded yams, with a texture somewhere between mashed potatoes and gnocchi. Aregbe taught us how to eat the dish as Nigerians do, with our hands: You break off a piece of dough and flatten it into an improvised ladle, and then use it to scoop up some of the stew — licking your fingers clean afterwards, if you're not in overly polite company, or else using the handy bowl of hand-washing water on the table. All in all: quite delicious, as the stew itself was spicy, vibrant, and rich — though much of the meat (with the exception of the tripe, which acted as a soft, chewy flavor sponge) was too tough to easily eat. Whether by accident or by design, most of the meats at Miliki just weren't tender enough. Most entrées at Miliki follow this basic format: Diners can mix and match between different stews, meats, and doughs (though Aregbe said the iyan is the most accessible option). 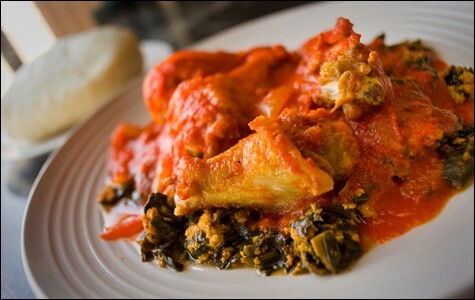 Only the daring, however, should opt for a bitter leaf variation of the egusi stew, which wasn't very bitter but had an intense pungency from chunks of (again, too-tough) goat meat and, especially, stockfish — thin strips of dried salted codfish with the same texture, and an even stronger fishy flavor, as those dried cuttlefish snacks sold at Asian markets. The result is a dish that, quite frankly, had a bit of a stink to it. I happened to love that salty-fishy punch, but timid eaters may not. Indeed, if you have a conservative American palate, you might just be in the wrong restaurant. But one entrée that any American soul food lover will be able to appreciate is the rice and bean combination, which comes with tomato-infused jollof rice, fried plantains, smoky and deeply flavorful slow-cooked beans, earthy stewed greens, and your choice of meat. The appetizers, meanwhile, tended to be crowd-pleasers. The suya (traditional beef skewers, minus the skewers), coated in a paste-like African spice rub, were very spicy, and especially good paired with slices of raw onion. The akara (bean fritters made from ground black-eyed peas) had a surprisingly light texture, reminiscent of Cajun-style fried eggplant — delicious, perhaps my favorite dish of all. And the moin-moin (steamed bean cakes, like Nigerian tamales) were remarkably smooth and flavorful, seasoned with red pepper and other spices. The most "challenging" dish of all was the fresh fish pepper soup appetizer, which is served with a big section of tilapia, cut from near the jaw or collar, so there's lots of delicate flesh and bits of slippery collagen. But the soup itself was spicy and slightly sweet, with a pronounced medicinal flavor. It's a comfort-food dish — Nigerians drink it when they have a cold, like chicken soup, Aregbe said — but an intense one if you haven't grown up with these flavors. Even the bottled beverages at Miliki were a journey into the unknown. During one visit I washed down bites of iyan with Malta Guinness — a hoppy, sweet, caramel-y, and non-alcoholic (though it's made by the brewery's Nigerian subsidiary) soda that grew on me with each progressive sip. Another time, we split a small bottle of chilled palm wine, which tasted like slightly fermented, sweet and sour asparagus. As with many of the restaurant's more challenging dishes, it could be described, fairly, as an acquired taste. The restaurant sits on a somewhat shabby — but also eclectic and vibrantly international — stretch of MacArthur Boulevard. There's a Christian church next to a Taoist meditation center, which is kitty-corner to a palm reading shop that's a couple doors down from a taekwondo dojang. The block boasts a Chinese restaurant, a burrito joint, a KFC, and, of course, Miliki — as good a place in Oakland as any for an adventurous eater to try something new.